In 1944, while the world outside was suffering from World War II, the Christian Brazilian painter Candido Portinari created the series ‘Retirantes’ (Migrants), showing that even far from the war Brazil was still far from peace. This series of paintings depicting the exodus out of the driest region of Brazil reminds us of the pilgrimage of the Jewish people in the desert, unsure of their fate and destination, without the courage to look at the horizon, afraid of the infinitude of sand. At its centre the painting Dead Child depicts a mother with her dead son sprawling in her arms. Around them the rest of the family is weeping bitterly, with tears made of stones matching the dry landscape. No help seems to come down from the sky, thus everyone cries with eyes downcast towards the earth. Old clothes and bodies hollowed out by hunger make us feel sorry for this family. Portinari reminds us of the humble condition of man, of how far we are from peace and that we cannot reach fullness life by our own efforts. He reminds us that God himself knows our suffering and came to share in our hardship, and that he died in order to achieve peace for each and all of us. 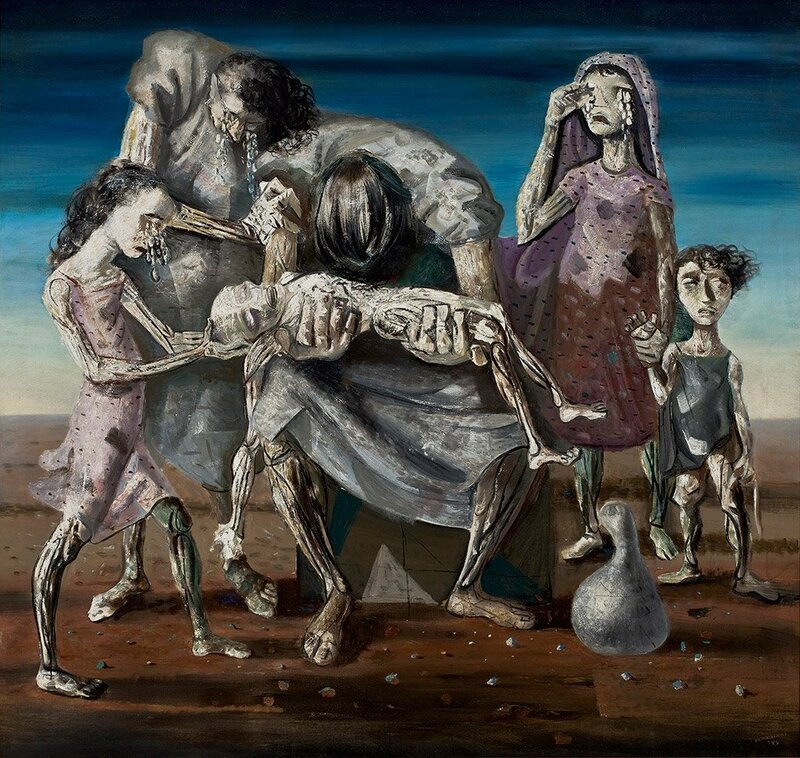 Candido Portinari: Dead Child (Criança morta), 1944, oil on canvas, 182 x 190 cm. Candido Portinari (1903-1962) was a Brazilian visual artist. Portinari painted nearly 5000 works from small sketches and paintings of standard proportions, such as The Coffee Farmer, to giant murals such as the War and Peace panels, presented to the UN headquarters in New York in 1956. Portinari is considered one of the most prestigious artists in Brazil. He also gained international recognition. In his works Portinari managed to portray social issues without displeasing the government and incorporated modern art features without losing the admiration of the general public. His paintings display influences of cubism, surrealism and Mexican mural painters, without, however, distancing himself completely from figurative art. Thiago Bragantin is Brazilian. He has a Bachelor of Philosophy from the Federal University of São Paulo (UNIFESP) and a Master of Divinity from the Theological Seminary Servant of Christ and one of the curators of the site https://www.culturaecompendium.com/.